I feel extremely lucky to be from the United States. No, I don’t think it is the best country in the world. There is alarmingly high income inequality. Racism is ingrained into the social and economic system. There are regular mass shootings. Health care is privatized. Corporations are people. Money is speech. I feel lucky to be an American because I can travel around America whenever I want. No visa required. I can stay there for as long as I want and do whatever I want. It’s so exciting. Before I started traveling, I thought everyone hated America and Americans. After 13.5 months of meeting people from all over the world, working behind bars and espresso machines, living in hostels and flats and staying at friendly houses, I’ve realized it’s quite the opposite. Everyone wants to go to America. People from all over the world have watched American movies their entire lives and they want to see Times Square, Hollywood, Las Vegas. They ask me if I’ve seen any movie stars and do I own any guns. Then they tell me about their aunt or brother or step-father who lived in Chicago for five years or they want to talk about how dangerous it is but it’s OK because they could easily disarm a man with a gun. Usually if an older Australian or New Zealander has traveled to America, they do it big. They are the grey nomads who roam the world after retirement. They tell me they rented a camper van and traveled from Washington to Nevada to North Dakota to Louisiana to Virginia to Maine. They comment on how very few Americans travel, even to their neighboring states. Sadly, I’m guilty. Tennessee and Kentucky are adjacent to Virginia, but I’ve never been. These nomads remind of how little I have seen of my country. 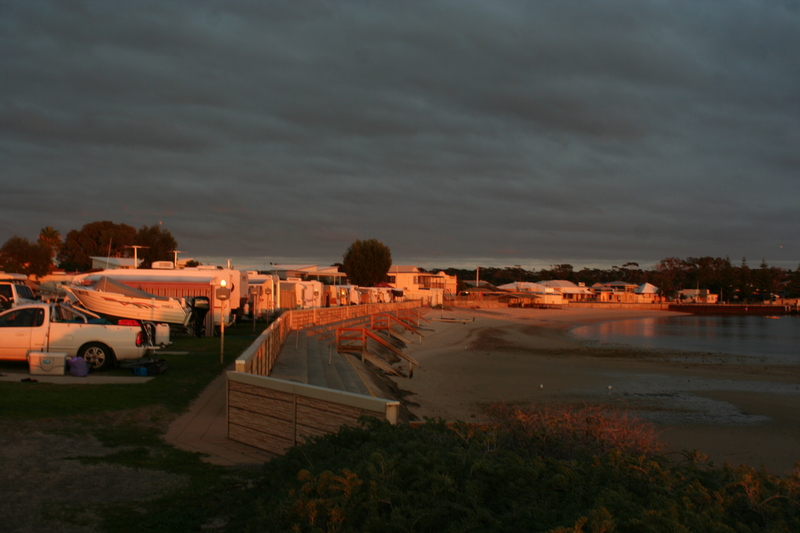 Caravan park full of old people in Port Vincent, near Adelaide. I’ve traveled all over the East Coast. Family in the North East, ex-girlfriend went to Clemson University in South Carolina, and my grandparents — of course — have a condo in Florida. I’ve visited some family in Oregon and took a trip to California after my little sister was Miss Virginia and we had to go to the nationals. I’ve skipped over the entire middle area. There is so much land there. I need to see what that’s all about. I feel like it is a foreign country. I’m lucky because traveling and working in America is very hard if you don’t have a US passport. The United States only has reciprocal working holiday agreements with five countries: Australia, New Zealand, Ireland, Singapore and South Korea. That’s a lot less than most other developed nations. Last night I talked to Hannah, a German girl who just came over to New Zealand after her Australian working holiday visa ended. She made me realize that travelers who want to work and holiday in America have to get creative. Hannah is looking into working as a summer camp counselor. There are programs that hire foreigners for three months to play team building games with little American boys and girls. The summer camp organizations apply for the work visa, pay for flights and accommodation and include three weeks of free travel time. These opportunities, however, are much more complicated than applying for a working holiday visa and hearing back in three days. Europeans like Hannah have the benefit of easily traveling around the Eurozone, but there are 50 unique mini-countries I can choose from. The only downside is that Americans inhabit all of them. Working in hospitality in a tourist town in Australia has taught me that Americans are by far the worst customers. They come in busloads to see Uluru and I can spot the yanks from a mile away. It’s the pure white New Balance tennis shoes purchased the day before the flight, the mispronunciation of Melbourne, and the general disregard for manners. Stereotypes are dangerous — there are plenty of considerate Americans — but this one is usually true. They think because their tour includes a free breakfast, they can blow right past the “Please Wait to be Seated” sign and somehow completely ignore the guy standing behind the desk asking for their room number. As soon as I started to criticize American tourists, my co-workers suddenly realized they can speak freely. Why don’t they ever say thank you?” Sonny, my manager, would say. “They think they own the world,” said Maureen, the morning supervisor. The problem is simple. Americans are used to their waiters and bartenders being forced to either give good service or go home empty handed. The two dollars an hour they earn in their fortnightly paycheck is a pittance. If they forgot to bring that bottle of ketchup table eight requested 15 minutes ago, they just lost money. Meanwhile, here I am staring at my phone behind a pool-side cafe in Australia, getting paid $24.60 AUD ($17.97 USD) an hour regardless of whether if I serve one cappuccino or 20 cocktails. If I’m slightly rude or inattentive to the occasional customer, my paycheck doesn’t change. The American tipping system, however, forces the waiters and bartenders to resent their co-workers and teaches the customer that they are the center of the universe. It’s capitalism at its finest. They have been trained to think they are entitled to everything and if something is different from the way it is back home, they don’t like it. Umm, excuse me, what kind of bacon is this?” It’s the kind of bacon that won’t cause you to have a premature heart attack. It’s what the rest of the world eats. Americans don’t like none of that fancy espresso coffee either. “I just want a regular cup of coffee!” No worries, sounds like you want a long black. No? You just want a regular black coffee? Uhh, all we have is espresso. 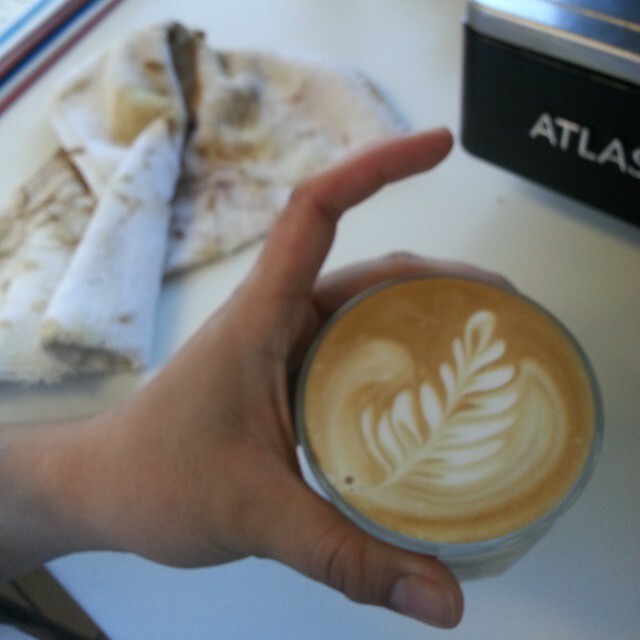 Can I please just make you a flat white? You’re not at the Waffle House, try something new. Leigh holding the last cup of coffee I made in Australia. They are loud and they have no self-awareness. There was an American woman with a slight southern accent who barged into the restaurant to refill her water bottle during the lull between brekkie and lunch. The general manager was having an important meeting with a client near the bar where I was polishing water glasses in silence. “You don’t look Australian! Where are you from?” she asks Rena, the unsmiling, overworked and under-appreciated morning chef in the open kitchen. We can’t hear her response from the other side of the restaurant — I assume she said Sri Lanka — but everyone is taken aback by the loud American. How’d’ya end up here?” she asks. This became my go-to annoying American tourist impersonation phrase. It is certainly not the Americans I’ve met abroad who have changed my mind about the untouched homeland, it’s everyone else I’ve met along the way. It’s the adventurous Aussies, the curious Kiwis, the happy-go-lucky European backpackers on a gap year, the incredibly brave Asian travelers a who barely speak english: They all tell me they want to go to America. If everyone else wants to see this country I grew up in, shouldn’t I? I would have never viewed America as such a diverse land with amazing landmarks and opportunities if I never left. I’ll just have to make it my mission to find the state with the least annoying people.